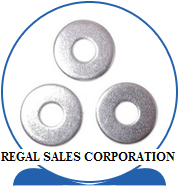 We,REGAL SALES CORPORATION, are a renowned manufacturer of high-quality machine washers. These Machine Washers are widely used in numerous industries in combination with nuts & bolts for providing firm support and vibration free operation to various machines. Our Machine Washers are made of premium quality raw material that is procured only from reliable and certified vendors to ensure the durability of our range.